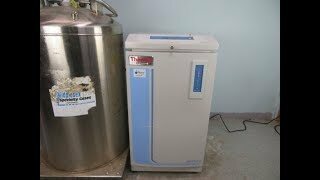 The Thermo Scientific CryoPlus Cryo Storage System offers microprocessor controlled precision, self-maintenance and user friendly programming for your cryogenic storage needs. This dewar is heavy duty and large capacity, designed to safe guard your samples with 16 preset audio and visual alarms, alarm contacts for remote monitoring, front mounted key lock, a rear mounted recessed control switch and a lockable control panel. The Low profile CryoPlus1 cryo system is sturdily constructed of powder coated steel, with a vacuum insulated stainless steel interior and is set on casters for easy moving. The lid of this liquid nitrogen storage system is counter balanced, insulated with foamed in place high density polyurethane, and two independent gaskets to help maintain proper temperature. The Thermo Scientific CryoPlus1 Cryo Storage System features 24 tricolor LED’s that continuously display liquid nitrogen levels as well as high- and low-level set points. The Thermo Scientific CryoPlus1 Cryo Storage system chamber holds 5500 to 6318 vials (depending on size) in a 90 L chamber with an automatic defogger to help improve visibility and make retrievals faster and more efficient. This Thermo Scientific CryoPlus Cryo Storage System has been leak tested and validation by our service team with a clean bill of health as part of our QC process. Please note there is a slight blemish in the paint, picutred, however it does not impact performance . All of our lab equipment comes backed with our standard warranty. Should you have any questions, please don't hesitate to contact us.